Every week we will feature two teams from around the country, this week we look at 2017 Ki o Rahi National Quarter-Finalists and two teams on the rise 5th placed Mana College and 6th placed Dannevirke High School. Mana College have been attending Ki o Rahi Nationals on and off for a while, someone out there might be able to help us out but we definitely remember seeing them in Wellington 2014, Gisborne 2015 and Auckland 2017. They're a strong team that have improved each time they've been at Nationals, with Auckland last year being their best finish to date. 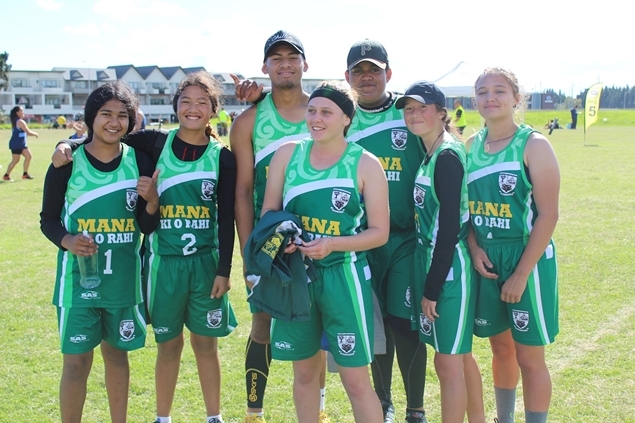 Mana finished 5th beating teams like Kawakawa mai Tawhiti, Lytton High School, Te Kura Kaupapa o Te Waiu o Ngati Porou, Tai Wananga, Hastings Boys and Girls and Dannevirke High School along the way. They had two losses in 2017, one in pool play to 2017 champions Te Kura Maori o Nga Tapuwae, where they scored the second most points of any team on them. Their other loss came in their first trip to the quarter finals where they lost to beasts Hamilton Boys and Girls. Mana definitely know how to score points, they have a solid Ki oma and an even more impressive Taniwha. One thing we've noticed about Mana over the years is that they shoot with a lot of power, a few of their shooters look like they may have transitioned over from sports like softball or maybe dodgeball, they have whip like arms. Getting a taste of finals in 2017 will no doubt have given Mana the desire to go one better in 2018, they know what it takes to reach this level of play now so will be doing everything possible in their preparations to break into that ever elusive top 4. Dannevirke might think they’re being slept on but their finish in 2017 has them well and truly on the radar. They've been steadily climbing the rankings over the last 3 years. After a low finish in 2015, they finished 8th at Tokoroa in 2016 and 6th in Auckland 2017. Dannevirke have a pretty well rounded attacking game like most of the top 6 teams of 2017, they scored some really impressive tries in Auckland and we also noticed an improved shooting game. An area that they could focus in on is their defence, they finished 2nd in their pool in 2017, with a tally of 81 points for and 74 points against, meaning they just scraped through to the championship rounds. But once they were there Dannevirke pushed Nga Tapuwae hard for 3 quarters before going down 22 - 10 in a game that could have gone either way. They then beat Te Ara Hou convincingly before losing a closely fought battle with Mana College 35 - 27. The way they're playing should ensure Dannevirke maintain their top 8 status but with an improved defence we can see them breaking through to the top 4. Dannevirke will be a team we will be keeping tabs on in Gisborne! We take a look at two of our favourite teams to watch Lytton High School and Tokoroa High School.